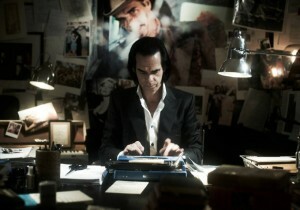 Trust Nick Cave to give the conventional a twist. What could have been one of those dusty career retro trips or a , shudder, ‘rockumentary’ has been pulled inside out and given a strange and macabre twist that is drenched in black humour and brilliant story telling. The film is a fast and loose take on just one of the 20 000 days of the title which sees the Caveman wrestling with his creative demons as he readies songs from thin air. It takes a pretty tripped out look at his normal life and fantastic imagination as they brawl around the wrestling ring of creativity trying to grapple with the muse. Of course it’s all blurred, the artist Cave makes out he’s living the normal life which is quite possibly the most fantastic leap in imagination in the film which sees visits from key collaborators in his long and feral career from a sprightly Kylie Minogue to a faintly menacing Blixa Bargeld who appears as a hallucination in the back seat of a car with Cave. It turns out he has not spoken to Nick for nearly twenty years since the pair stopped working together when Blixa emailed Nick and said he was going to concentrate full time on Einsturzende Neubaten again. The film is set against Cave’s writing the number one Push the Sky Away album- the moment when in the Uk at least he stepped from the shadows and into the mainstream with a fantastic body of brooding work that is scored with the passion, the louche balladeering and dark sense of humour that we love him for. There are glimpses of him working with Bad Seed Warren Ellis- as they examine their working relationship and Ray Winstone pops up and turns to be a big buddy with Nick. Or is that just part of the blur? Inbetween the semi surreal flow of characters Nick Cave opens up in a mock therapist session and there are blurred clips of a wild musical past from Australia to London to Berlin and on to Brighton before coming bang up to date with a great live version of Jubilee Street and a ten minute lope through the classic Higgs Boson Blues- both key tracks from the current album. The film gives little away but it’s a place to get lost in, a great twist on the traditional and a rock film that allows the one major ingredient back into play- the imagination. In times of confessional and weepy TV docs and rock films that tell the monotone tales of plodding talent dwarves it’s great to be invited to a trip where reality and fantasy blur into an entertianing and slyly dark work.